Plagiarism Detector - is a Plagiarism Detection software to quickly discover, trace and in this way prevent unauthorized copy-pasting of any textual material taken from the world wide web. Plagiarism Detector checks batches of source files in DOC, DOCX, PDF, RTF, PPT, and TXT format against the massive Google search index, quickly producing immediate results in the form of reports that flag every instance of potential plagiarism. 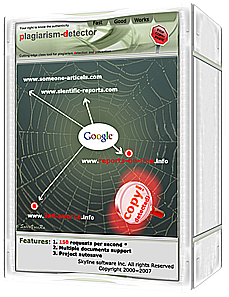 Plagiarism Detector - most powerful Plagiarism detection Software. Qweas is providing links to Plagiarism Detector 317 as a courtesy, and makes no representations regarding Plagiarism Detector or any other applications or any information related thereto. Any questions, complaints or claims regarding this application Plagiarism Detector 317 must be directed to the appropriate software vendor. You may click the publisher link of Plagiarism Detector on the top of this page to get more details about the vendor.